High up on the rocky limestone and granite slopes of Antle vineyard in the historic Chalone AVA, a block of Enfield Pinot Noir is planted next to a block of Dirty and Rowdy Mourvedre. From the beginning the wines displayed as much in common as they did in difference, their sense of place shining through the name given to their grape. What started as a playful tasting experiment soon became a serious conversation. The structure and length of Mourvedre combine with the softness and mid-palate of Pinot Noir to create a wine that is seamless from start to finish. 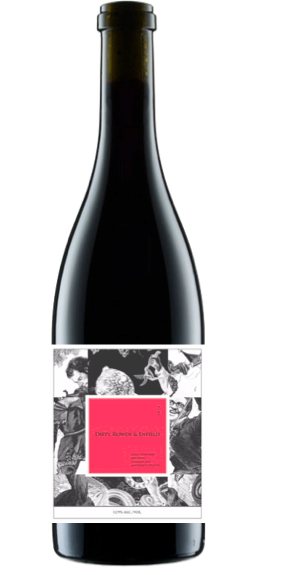 This wine is all about synergy – of red and black, of spice and stone, of depth and purity. Bright red tinted with black and light/medium in body. Crushed rock, rose petal, bruised strawberry and black tea on the nose. Cranberry and soft spiced pear on the palate, but with a stony spine and a long mineral finish. Drink 2016 - 2021 Aromatically this wine is already lovely and open, but it's powerful mineral backbone will benefit from time in bottle to soften and it should age nicely. If drinking within 6 months, we strongly recommend a 1 hour decant and pairing with food.